Print out or email information about individual works by simply highlighting the work and clicking the Document arrow to produce an Infosheet.Create a Fax or Letter document linked with a Contact.Or produce an individual Transaction Document (Cash Sale, Consignment Out, Credit Memo, Exhibition, Loan, Offer, Payment to Consignor or Co-Owner, Receive Payment, Return, Shipment and Work Receipt) by highlighting or opening a transaction and clicking the Document arrow. In addition to US style documents with Tax Jurisdictions, there are also comparable standard Transaction Document templates linking to VAT (for example Invoice with VAT). Pro offers a broad array of automated reporting options. 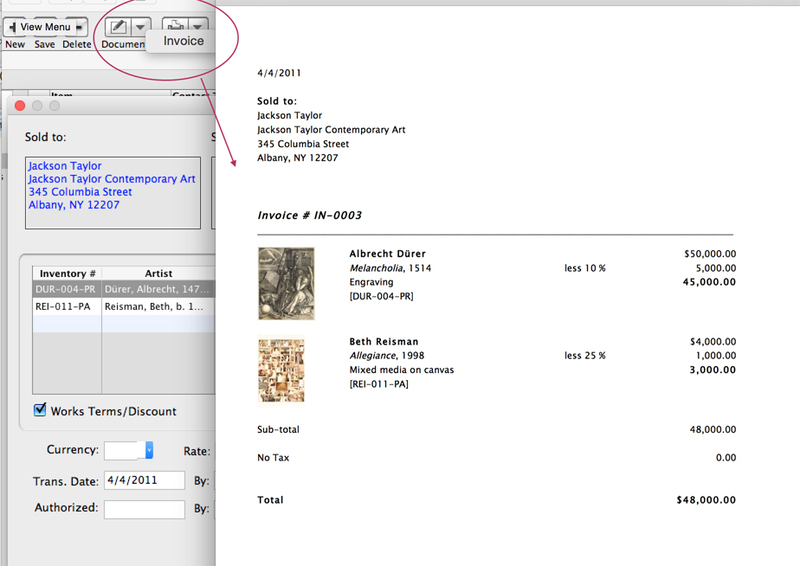 Select or create a group of records in any Pro module — Contacts, Works, Editions, Transactions, or References. 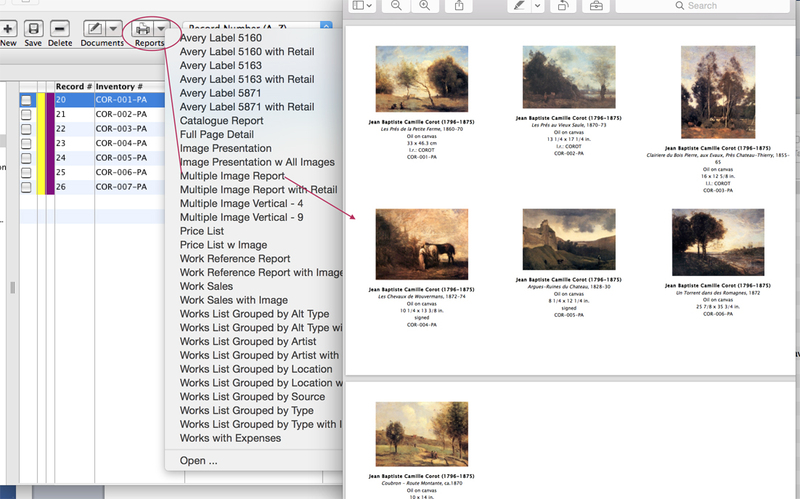 Choose from the more than 140 standard report templates in US or A4 format, including for financials, image presentation, and separate internal reports such as Works Grouped by Location, Source, or Artist, Works with Expenses — all with or without work images, and many more. Reports are generated in Microsoft Word to allow for on-screen editing — a major advantage. 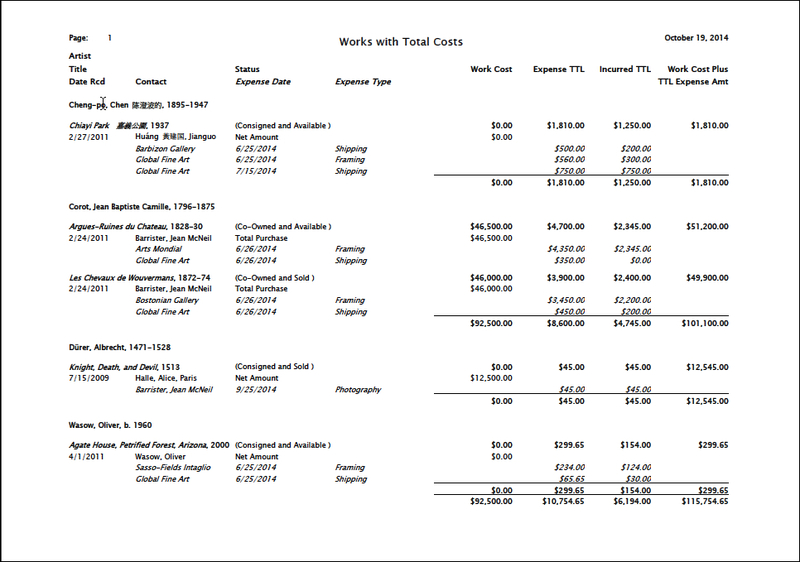 Together, this flexibility, power, and control in reporting is invaluable to any serious art business or collection. 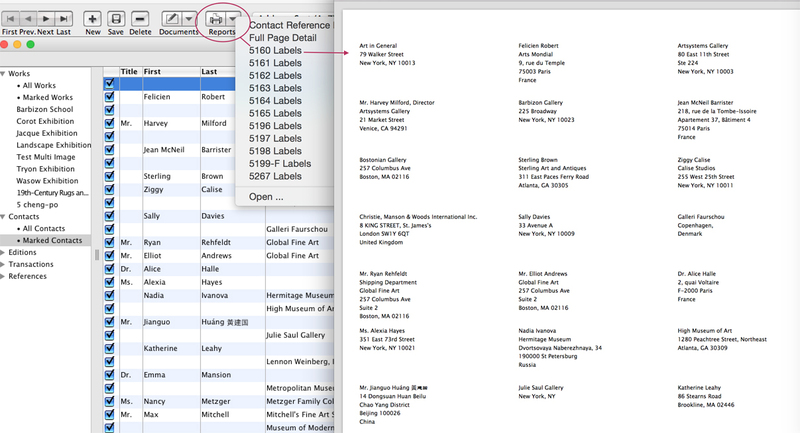 Make mailing labels from Contact records in a variety of US and A4 formats, or make lists of Contacts to determine common interests for marketing purposes.Create exhibition labels or inventory labels (with or without barcodes) to be affixed to the wall, crates or to the artworks proper. Create and save custom spreadsheet views in any module, choosing from nearly any field in any module to focus on information of particular interest. To print your custom spreadsheet report, click the printer icon in the Pro menu, customize the fonts and choose whether to display images and/or totals. View our tutorial video for a walk through. 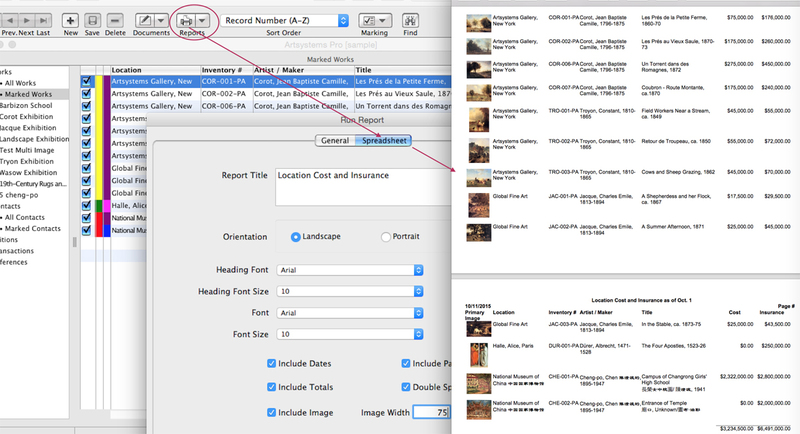 Read more about the flexible Pro Spreadsheet View in the Pro Navigation section. Our 140 standard reports may not show the precise information you want to extract about your collection of Works or show the information you want on a particular Transaction document, so you may contract the Custom Reports department to create a template to show the information you want the way you want it to show.